A hungry ferret has caused panic on a train by racing around carriages and eating the driver's lunch, a train company says. Frightened passengers screamed as the stray animal clambered over their laps after jumping on board at Long Eaton station in Derbyshire. The feral animal ran at top speed around the Midland Mainline service, before it sneaked into the driver's cab and dived into his lunch box. A company spokesman said the driver then fed the ferret his cheese sandwiches and biscuits to keep the animal happy. "The passengers were all scared stiff that the ferret was going to bite them. "They were all going crazy," said the Midland Mainline spokesman. 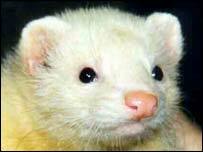 "We have recently introduced a clampdown on fare-dodging - we are thinking of introducing a new policy of ferret-dodging." After discovering the animal, the train driver radioed ahead to Leicester, 15 minutes down the track, to ask for help. RSPCA inspectors were called on board and took the ferret away in a cardboard box.